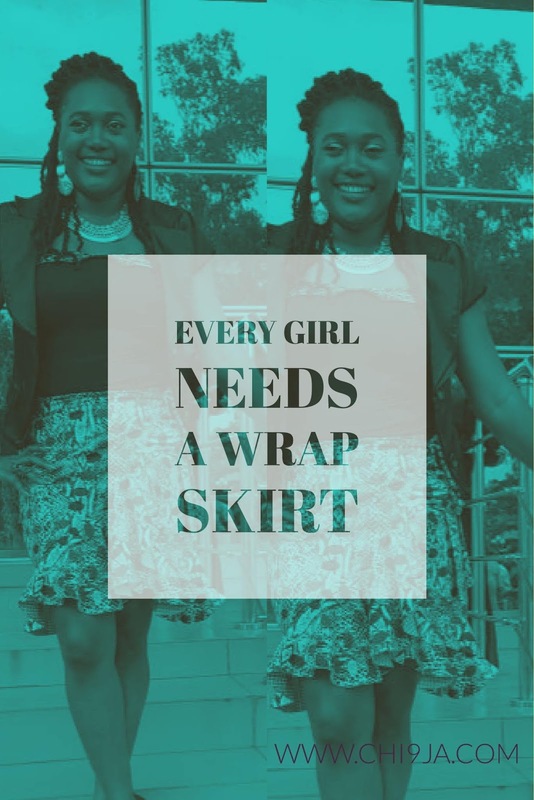 "Every girl needs a ruffled wrap skirt"
I can't say this is a statement, I have ever agreed with or totally agree with now since my new skirt was made, but as imperfect as my new ruffled wrap skirt is, I'll have you know that I love it. I am now a very proud member of the ruffled wrap skirt gang. 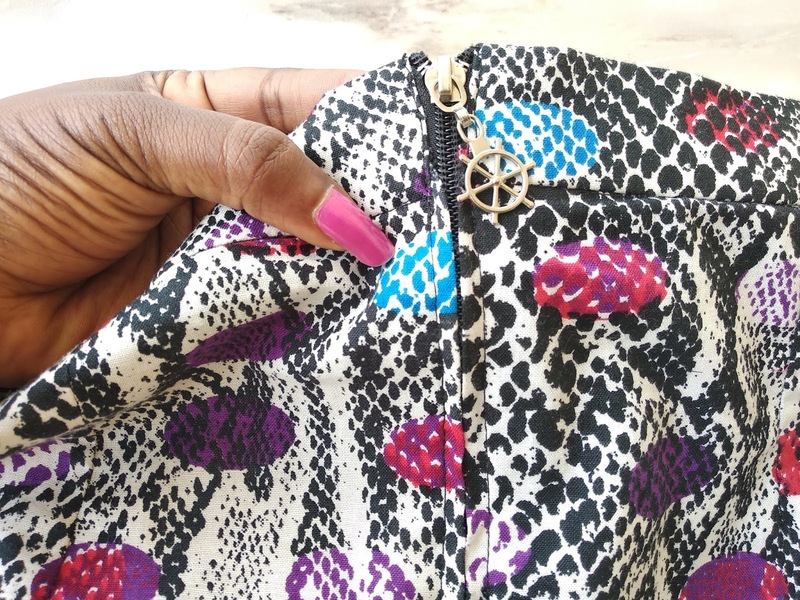 You see the reason I never liked wrap anything is that they remind me so much of the type of things my grand mum would wear, especially wrap tops LOL. But I couldn't resist all the ruffle and wrap sensation going around. 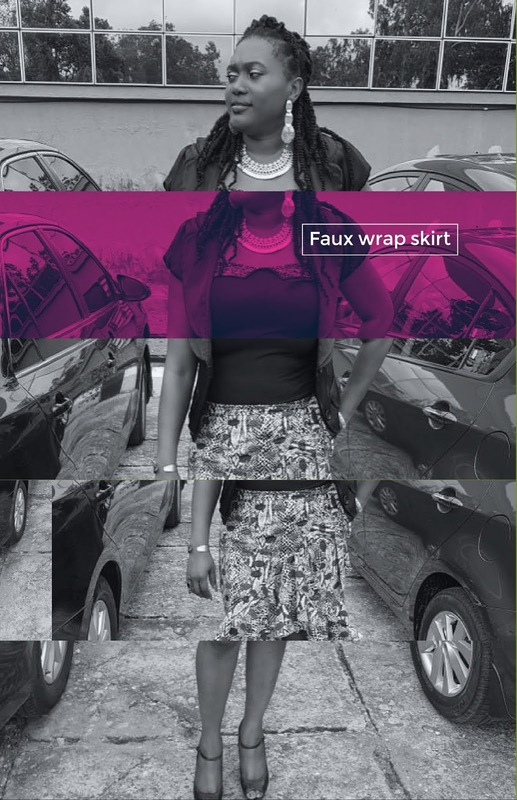 Even though this is technically a faux tie wrap skirt. I also couldn't resist all the gingham going around either, so, I decided to combine all in a project. When I showed my fabric pairings to my sister-in-law the sheer look of disbelief on her face was priceless 😂😂😂😂. This skirt is by no means perfect, as a matter of fact, there are lots of mistakes but I love it. Also, this skirt is on my #2018makenine and #2018usenine lists, so I'm happy to be making a dent in the list. The other reason I'm so in love with this skirt is that this is my first fitted(woven) skirt that fits properly. I only just figured out what I've been doing wrong. So, turns out I've been measuring the full length of my skirt (waistband included) but still cutting up a waistband and sewing it onto the full length of the skirt. 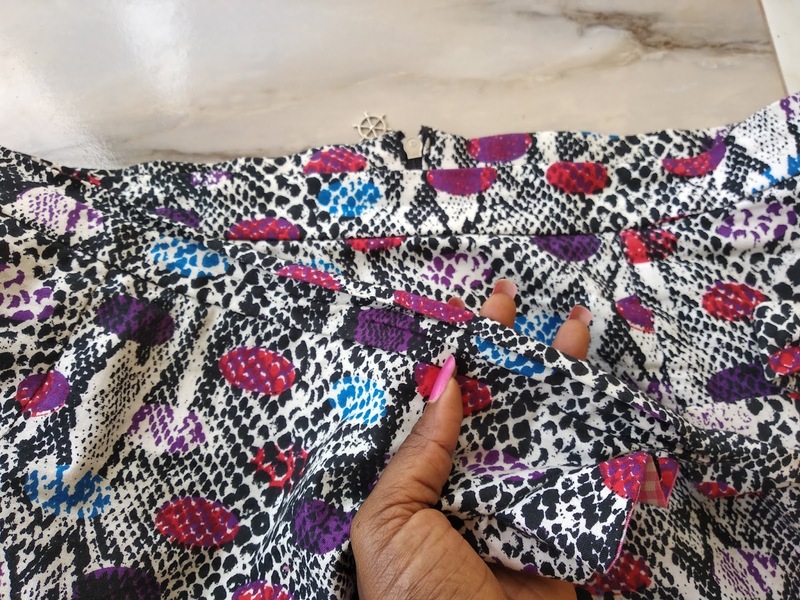 This was making the skirt sit funny on me because the hip measurement would be lowered by whatever length my waistband was for that particular project. Don't know why it took me so long to figure out. I used this beautiful Ankara print fabric that looks like snakeskin with splotches is green, purple, red, etc on it and decided to line the reverse of the flounce with some pink gingham fabric. 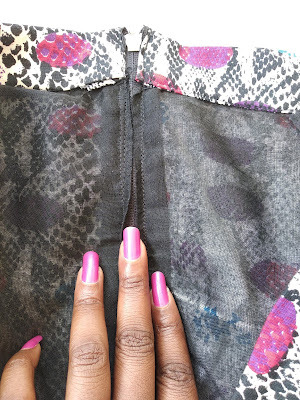 There isn't any pink on the Ankara fabric but since it had a lot of dark colours I felt like a lighter colour(pink) would stand out more. I just used regular lightweight cotton for the lining. This was the first bit of trouble I got into. 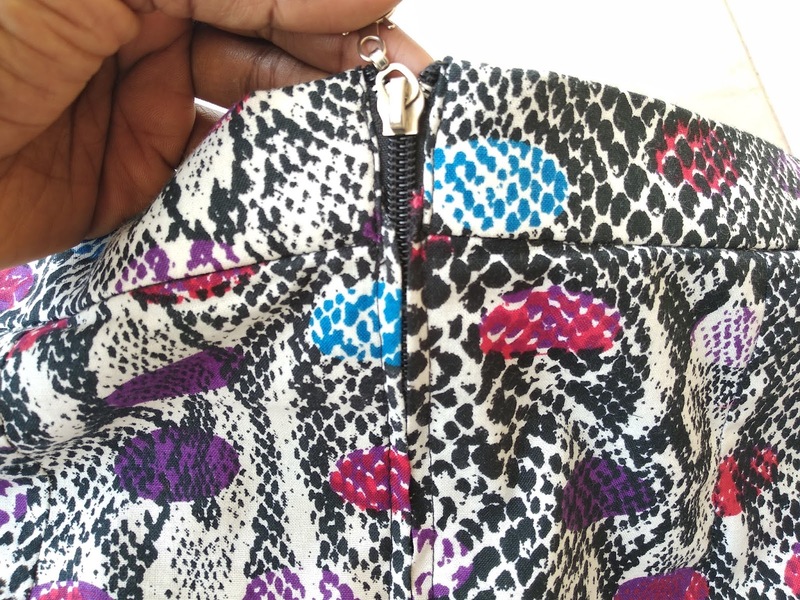 And it made me realize how much of an invisible zipper girl I am to the point where other zippers are a pain to me, crazy I know 😂😂. 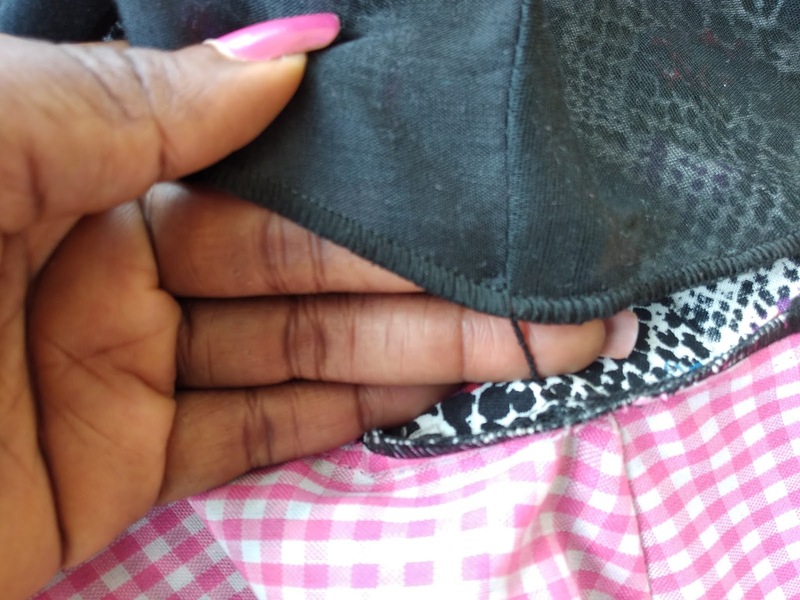 I decided against an invisible zipper in this project because I felt the weight of the fabric at that seam would be too heavy for it. 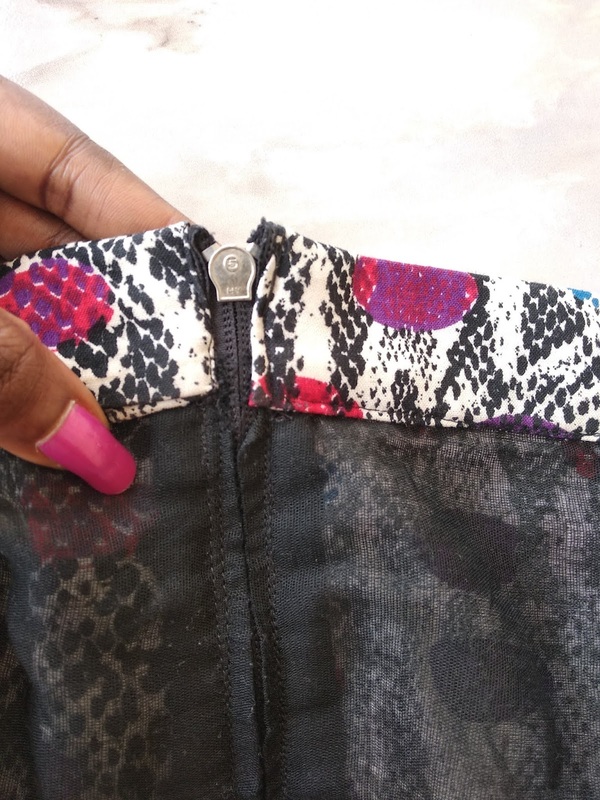 This whole invisible zipper or nothing issue I just figured out I had is the only reason I can find for not just attaching my railroad/centered zipper to the waistband like any normal person. 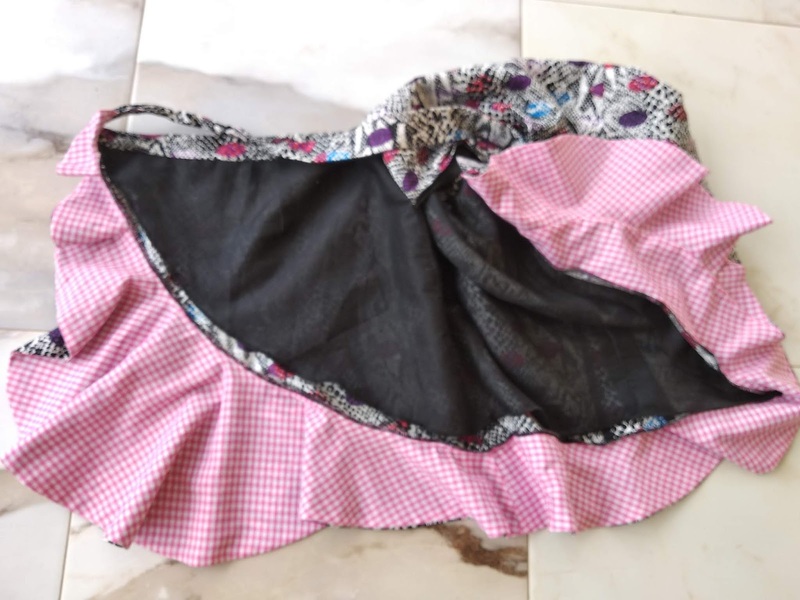 Instead, I thought it'd be a brilliant idea to attach the skirt + lining to the zipper in one go, then, attach the waistband (boys and girls at home, DO NOT DO THIS) because this is what you will end up with. The linning getting stuck in the zipper teeth whenever you are zipping your skirt up or down. But I promise I do know how to install a railroad zipper. This was the next bit of tricky business. After the nightmare I went through trying to attach the waistband to the zipper I felt sure that attaching the rest of the waistband to the skirt would be a breeze. 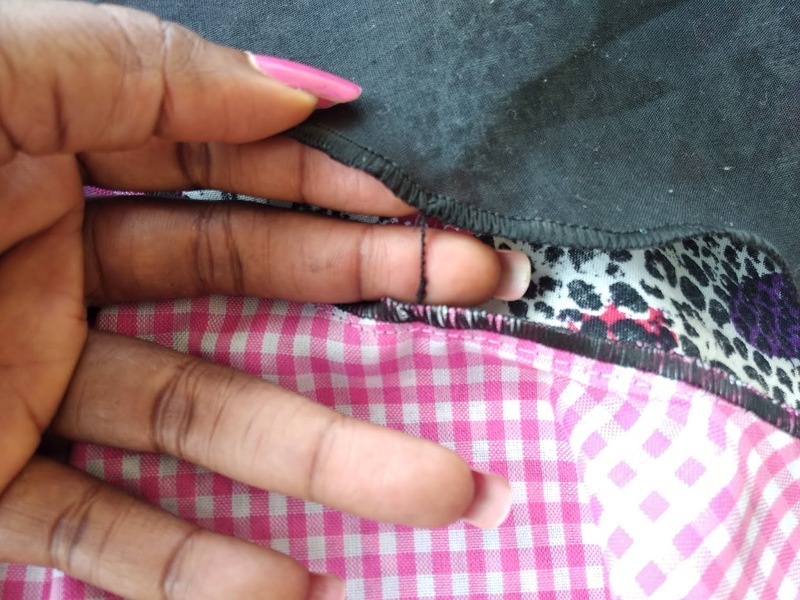 NOOOOOOOO, I did the regular stitch-in-the-ditch for the waistband sitting closest to my body, but when it got round to attaching it on the other end, I got stuck. 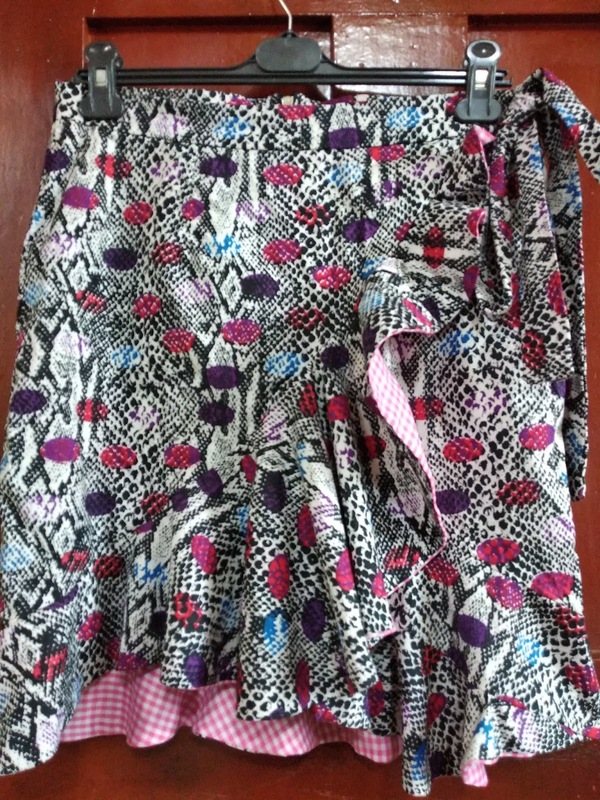 Since it was a faux tie wrap skirt I knew I didn't want/couldn't have the tie coming out through the waistband. What to do, What to do........crickets!!!!!!!!!!! Writing it down makes it seem like all this pondering happened in minutes, but, I promise you it took me 3days because I truly did not envision being stuck on a wrap skirt, lol, like, they always look so easy when other people make them. I couldn't work my head around it and of course, I didn't have anything ready-to-wear to refer to, because........ I didn't do wrap anything up till now. So, in the end, I just opted to just stitch it down at the waist and called it a day. Now for the front waistband that extended to a tie and the band/tie on the other end, I was worried about creating bulk at my waistline so I didn't interface them. Which I'm sure you can tell by how its folded, this doesn't look too bad when the skirt is on though. You need a loop turner or something to turn loops with. Nothing much to talk about here, I just sewed it up like normal, but I only serged the ends. Then I noticed they kept riding up when I walked so I attached them to the skit with thread loops. 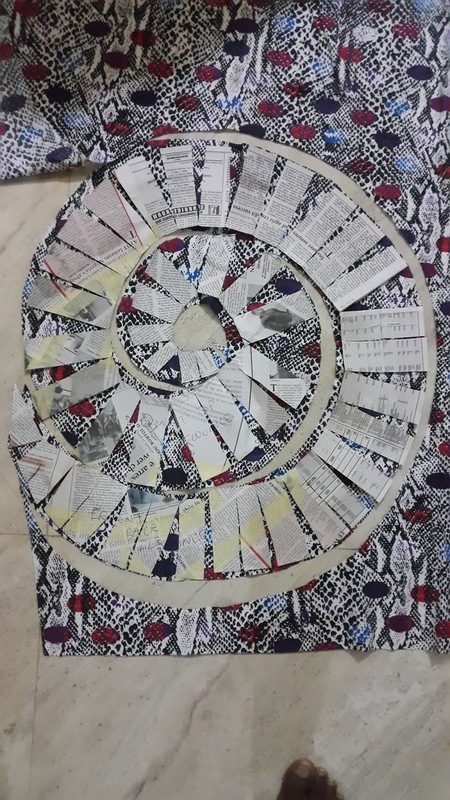 I saw this circular method of drafting a flounce from one of my favourite youtube sewing channels and I thought I'd give it a try as it looked like it saved fabric, unlike the traditional circle patterns. 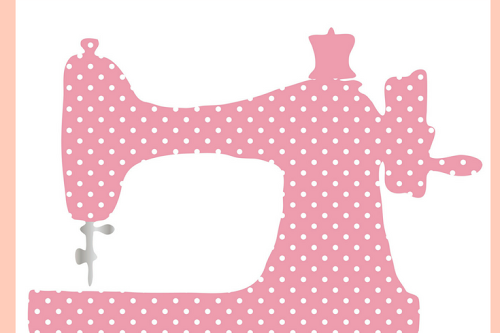 All I did was measure the width and full length of the flounce, front through the back to the front again. 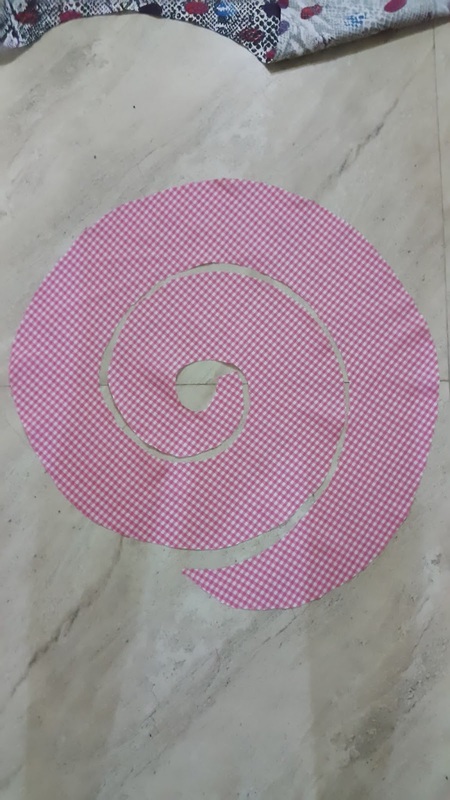 With these measurements, I did a slash and spread but in this spiral form you see here, and cut around. I repeated the same thing for the gingham piece. 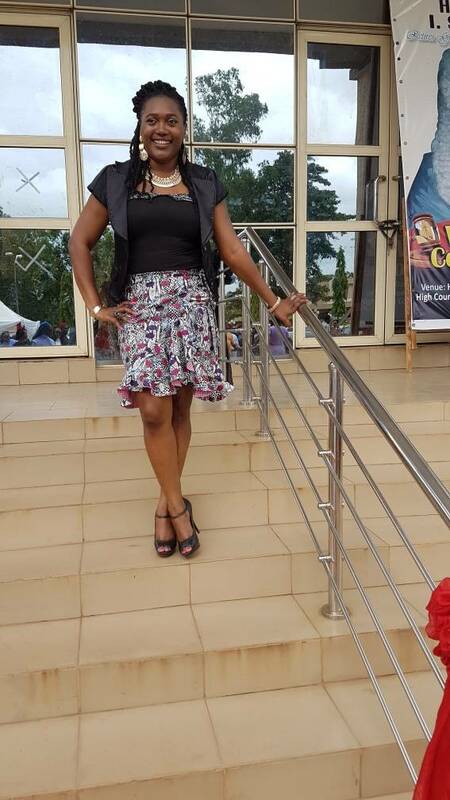 And I might be wrong but I feel this method did save on fabric, except after I tacked it onto the skirt body and went to look in the mirror, I discovered the front of the skirt was wayyyyyyy too short for my taste, add that to the fact that the event I was attending was formal. So, I ended up cutting another flounce for the skirt but not a straight up spiral, I made the parts in the front longer and it looked good on. 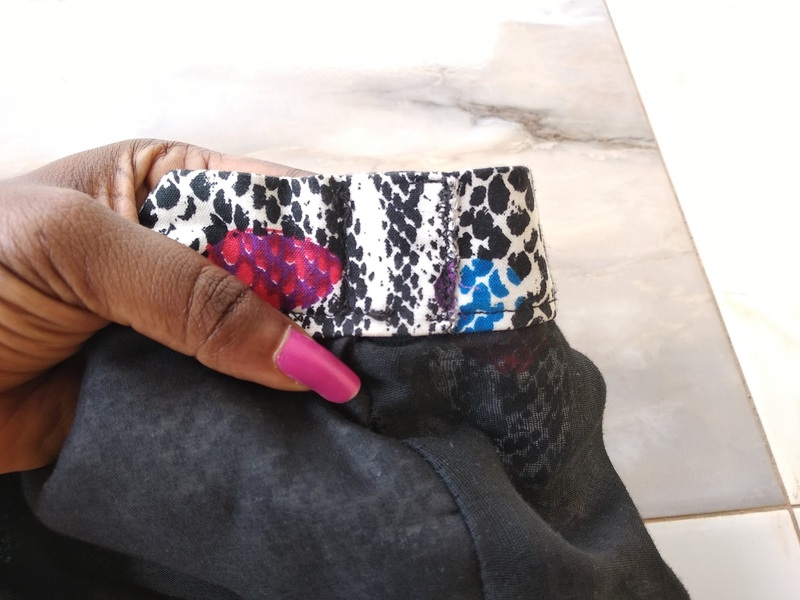 While I was writing up this post, the reason for the waistband disaster HIT ME!!!!!!!! Think about it for a minute, LOL. 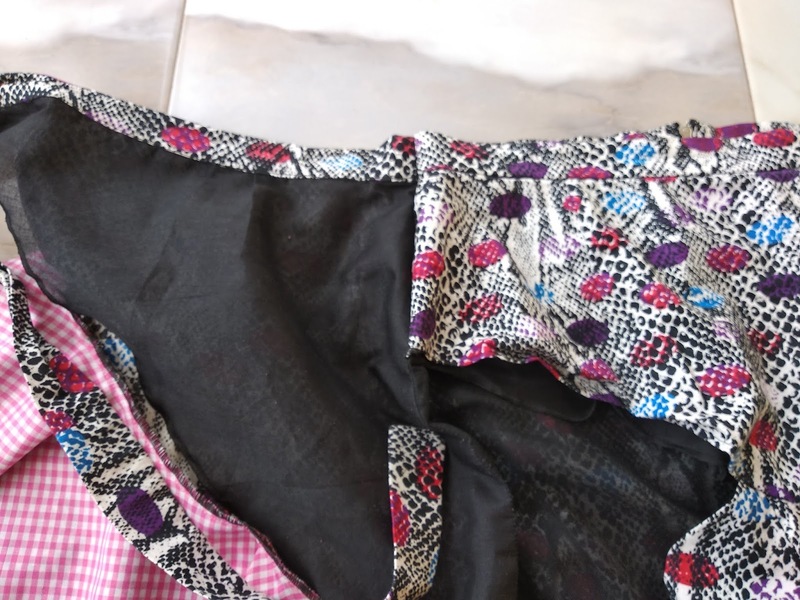 Proper/real wrap skirts have a hole in the waistband where the tie can exit and wrap around the waist at the opposite end, while most faux tie wrap skirts are joined at the side seam like mine was but have a single waistband with no ties. 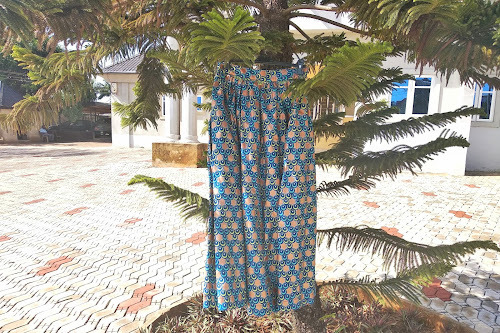 But yours truly decided to mix elements from both without completely thinking it through OR am I wrong, and there's a proper way to stitch up this version of a wrap skirt? PLSSS Do let me know? The skirt felt great to wear, the waistband didn't dig into my tummy, the skirt didn't feel tight around my hips( a serious pet peeve of mine), as my other attempts have in the past. And these are still pictures so you don't get the effect of the flounce in motion, it had a kick flare effect. I'm very very pleased. And, yes, I'd absolutely make this skirt again, without the mistakes of course, But I'm considering making a top with the leftover fabric. Something simple but still mixing in the gingham print. So, are you for wrap skirts or nah? 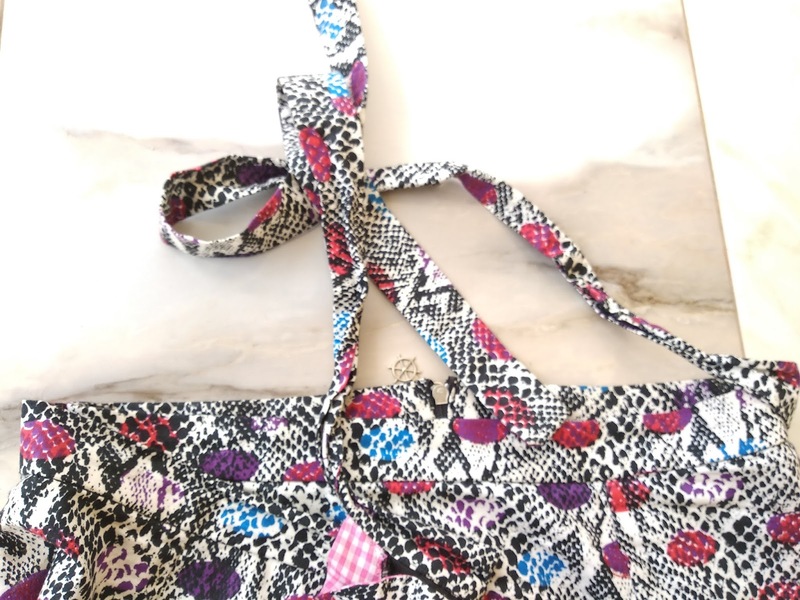 Do you like my fabric combinations or not? Let's have a conversation in the comment section, I'd really love to know your thoughts. And while you're here don't forget to join the fam, sign up to my email list, I'd love to share more fun makes with you. Also, share this content with your friends who you think would be interested.